School Library Journal School Library Journal | Lots & Lots of Really Big Trains: Giants on the Rails! 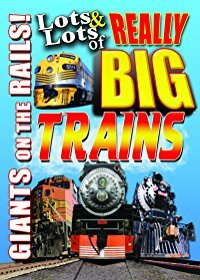 School Library Journal | Lots & Lots of Really Big Trains: Giants on the Rails! Lots & Lots of Really Big Trains: Giants on the Rails! Lots & Lots of Really Big Trains: Giants on the Rails! 75 min. Marshall Publishing & Promotions. 2018. $14.95. ISBN 9781936134311. PreS-K— Like other "Lots & Lots of" DVDs, this one features catchy songs by children's musician James Coffey. It is very likely viewers will find themselves humming "I love big trains…really BIG trains" after viewing. Songs are paired with live-action footage of trains of every color and type on scenic railroads around the world. Steam whistles, chugging engines, clacking wheels, and blaring horns are showcased with no interrupting narration. Three special bonus videos feature footage of trains with no music or voice-over, interspersed with animated segments (essentially a still photo of an engine with a super-imposed moving mouth) to demonstrate how steam and diesel trains operate. VERDICT The prime audience is three to five years old, but other enthusiasts will certainly be entertained and enjoy learning how trains operate. A good addition to public library or school library collections.